That truly is a good question. I have devoted my life to educating the public about their wild heritage. The method I’ve felt is the best for me to get this message out is photography. But as we all know, there’s more to photography then an f/stop or camera brand. We must have those essentials of course but we need a whole lot more. So in order to reach my own personal goal, I shoot one helluva a lot and during that process have learned some from my failures and successes. I’ve also learned that my greater goal requires more then one shooter. This is why we put such an effort in sharing all I’ve learned with others. All of that is wrapped up in the answer, why I wrote this book. The reason the book is 396 pages is because it took that many to really answer, completely, the questions that my goals in wildlife photography brought to my door step. It has taken 30yrs to find just some of the answers and realize there are still more questions to answer. It’s this journey of time, exploration and passion for our wildlife that I bring out in the book so others can learn from what I’ve been able to accomplish so they can take that and run with it. It’s is very rewarding to hear from folks that they have read the book and already felt the call to do more with their photography. Even more is to be told that folks look at their photography differently, with more heart, more passion after reading Captured. The title has many ways it can be interrupted but when I came up with that title, the photograph really wasn’t what I was thinking about. Rather, it’s the effect YOUR photograph can have on those looking at your moment in time that you are sharing. As I mention many times in the book, I think I’m in the business of grabbing heartstrings and when you look at any photograph by any photographer, success comes when their heart is, Captured! How did Capture get its look? My original title for the book was simply, Journal of a Wilderness Photographer. As you can see, that wasn’t used but it did give the book its character and it was still written as the title suggests, as a Journal. It was written with the intention with someone reading by starting on page 1 and then going to pg2, 3, 4 and so forth. But as I was educated, I’m an old fart and only I read a book this way. With that all the “field notes” were added to the book so folks could skip around. Jessie is the very talented and brilliant designer having read the book, laid it out keeping it true to me and my message. She’s the one who truly gave Captured its visual look and feel and did it perfectly as far as I’m concerned. Captured is not about being a “legend” or having the best photos (because that’s not what I’m about), it’s about being the best one can be and then making a difference in the world with what that produces. So the look of Capture comes from my heart that was translated by the very talented and heart felt gang at Kelby Media and put into your hands. Captured was written with the intention to be read, starting at Pg1 and going through to Pg396. I was very fortunate that my editor Scott Kelby pointed out that most don’t read a book these days like that (showing I’m an old fart). Rather, most folks skip around. So in recognizing this there is tons of little tidbits in the book just for this reason. Captured is my 24th book with a ton of the basics of photography covered in those books and here in the pages of the blog. So I didn’t rewrite all that material but moved on based on that material. The basics of what is an f/stop or what does ED mean aren’t in Captured. Captured explored what really hasn’t been covered before by authors and that’s refining, improving and employing the most important tool in photography, YOU! And guess what, there is no recipe for that which is another reason why there are so many pages. One aspect of photography I have come to learn in my 30yrs is that every click is a compilation of one’s life up to that moment. Conscious and subconscious, it all comes into play which what makes each one of us a unique visual communicator. I truly want to see what you find in your photographic explorations. I don’t want you to have to have reinvent the wheel but help you roll it along further. That’s what Capture is all about. Guillaume Meriaux said, “I just finished to read your new new book “Captured” and I cannot put in words how much I loved it. This is by far the best book ever about wildlife photography, thank you to take the time to write it. The photography, the text, the stories, … everything is so captivating and inspiring. I first heard about your book when I saw you and Scott Kelby in a video, Scott was so excited. I first thought sure Scott is excited because he is producing the book and will probably make a fair amount money. But I have followed Scott for some time now and know that he is an honest and all around great guy. Tom Walker said, “Moose Peterson’s new book Captured is the perfect name for this book. Whether you are just getting into photography or, are a seasoned pro shooter Moose will share with you his passion, techniques and an amazing amount of real world photographic experiences in every day language. In this book, Moose discusses how how got started in Wildlife Photography and he shares a alot of information on the techniques he developed to make successful images that not only capture the image but, images that capture the emotion and what it felt like to be there when the photo was taken. Moose’s writing style is easy to read, like sitting down with him having a conversation. It’s written in easy to understand language even the new photographer enthusiast would be able to comprehend. 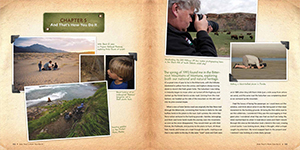 He shares insights and how to information to capture the various shots in the book. 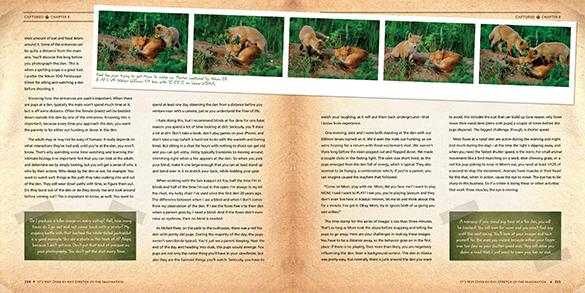 His passion for wildlife, the preservation of and diversity comes through and inspires the reader to discover wildlife photography in their own backyard on their own terms.